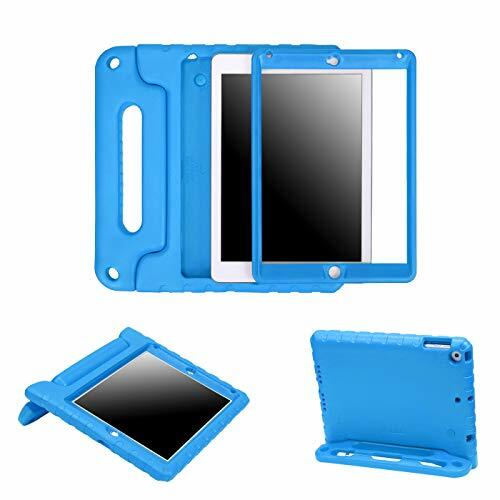 Kids are known for being rough with their toys, protect your New iPad 2018 or 2017 Release from rambunctious little hands with this durable shockproof cover with built-in screen protector. These cases are designed to be resistant to the random spills, bumps, and sudden drops that you expect from your little ones, protecting their iPad 9.7" tablet in a layer of durable, kid-safe EVA foam material that insulates their tablet from daily use. Adding another line of defense, these shockproof cases come with a durable built-in screen protector that prevents damage to the iPad's display. Each case comes in bright, eye-catching colors that your kids are sure to love and feature a foldable, rugged-grip handle so your child can carry their tablet around like a suitcase.